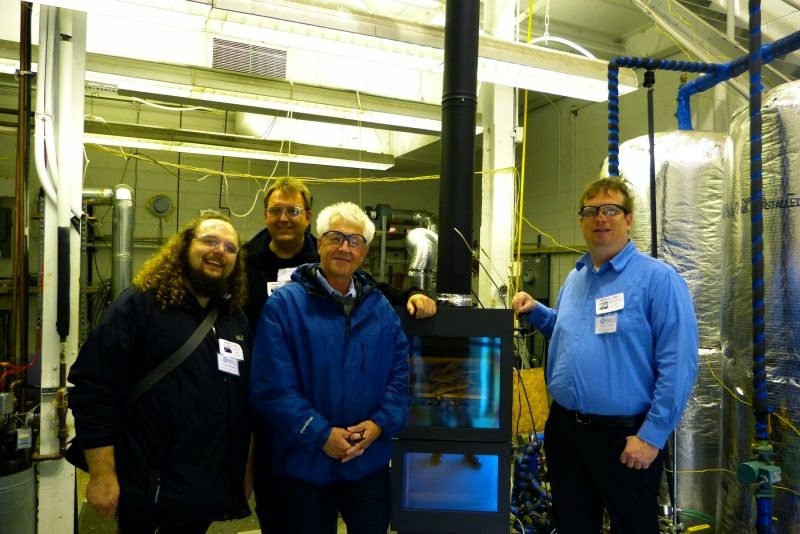 highest score in an international Stove Design Workshop focused on automated wood stove technology. The goal of the event was to assess innovative technologies that can help stoves reduce real-world emissions that result from poor operation by the consumer and use of unseasoned wood, both of which are widespread problems. Ten judges scored the stoves based on emissions, efficiency, innovation, market appeal and safety. The highest scoring stove, the Mulciber, adapted emission control techniques that are in automobiles, such as an oxygen sensor that controls the fuel-to-air ratio, a continuously engaged catalyst and an exhaust gas fan. The Mulciber was also tested with unseasoned, 50% moisture content wood and performed quite well. The team, who had never built a stove before the 2013 Wood Stove Decathlon, overhauled their first prototype and have now formed the company MF Fire to bring the stove to market. 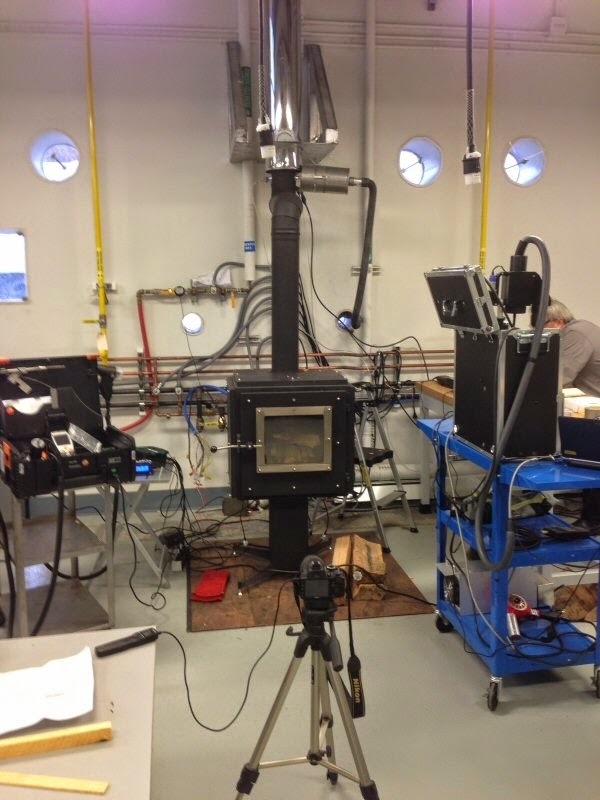 The Workshop was held at the DOE’s Brookhaven National Laboratory in New York and brought together a diverse range of stakeholders - students, professors, industry, regulators, air quality experts - who spent a week together analyzing the problems and solutions to residential cord wood emissions. Five stoves competed in the event, which is part of the ongoing Wood Stove Design Challenge run by the non-profit group, Alliance for Green Heat. In 2013, the Design Challenge hosted the Wood Stove Decathlon on the National Mall in Washington DC, a high profile event modeled after the Solar Decathlon. This year, the event was at a lab so that stoves could be tested more rigorously and test data could be shared with the participants. The core problem is that most consumers do not operate wood stoves well and many use unseasoned wood. In addition, EPA certification testing for wood stoves do not simulate how wood is burned in people’s homes. For decades, manufacturers have been building stoves to pass that test, but not necessarily to burn cleanly in homes. This workshop addressed that by testing with cordwood that was not fully seasoned, capturing some start-up emissions in the test and assessing how automation can reduce operator error. At Brookhaven, stoves were tested at four parts of their burn cycle: warm start, steady state 1, hot reload and steady state 2. The current EPA stove certification test uses seasoned 2x4s and 4x4s and only tests for emissions after the start-up period, once the stove is hot. Automated stoves, where computers, not consumers, adjust the air-to-fuel ratio, cannot be tested by EPA test methods so they are not able to enter the US marketplace. A major goal of the Workshop was to start designing an alternative test method to the EPA’s method, so that automated stoves can be tested and become certified in the US, as they already are in Europe. Tom Butcher, a senior scientist at Brookhaven Lab, hosted one of the public webinars during the week on that topic. 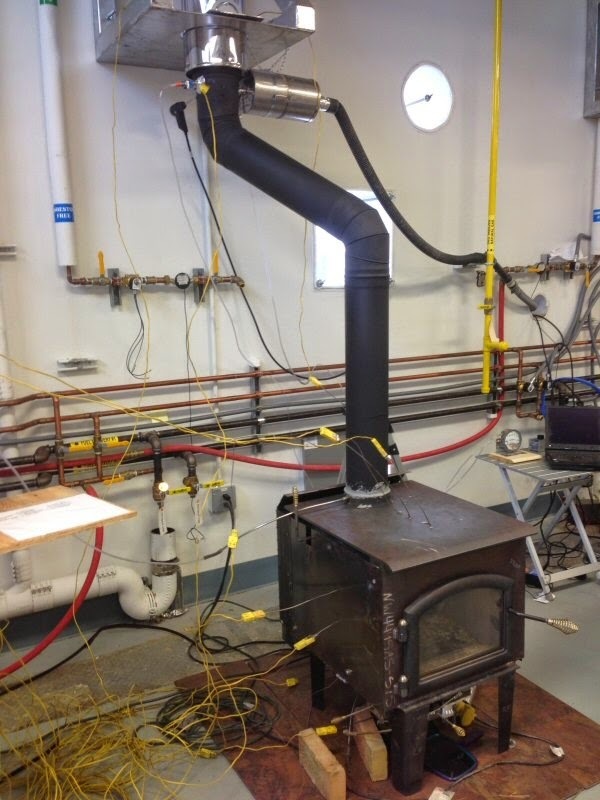 Rankings: The judges gave double weight to emissions and efficiency, as they did in the 2013 Wood Stove Decathlon, because of the importance of those values. This year, the judges decided not to judge affordability since most of the stoves were prototypes or technologies designed to be integrated into other stoves and ultimate costs and pricing was too speculative. Each of the 10 judges scored each stove on innovation and market appeal. The other three criteria were based on lab tests. “We want to congratulate the MF Fire team - and all the teams - for participating in a process of sharing innovation, ideas and test results,” said John Ackerly, coordinator of the event and President of the Alliance for Green Heat. 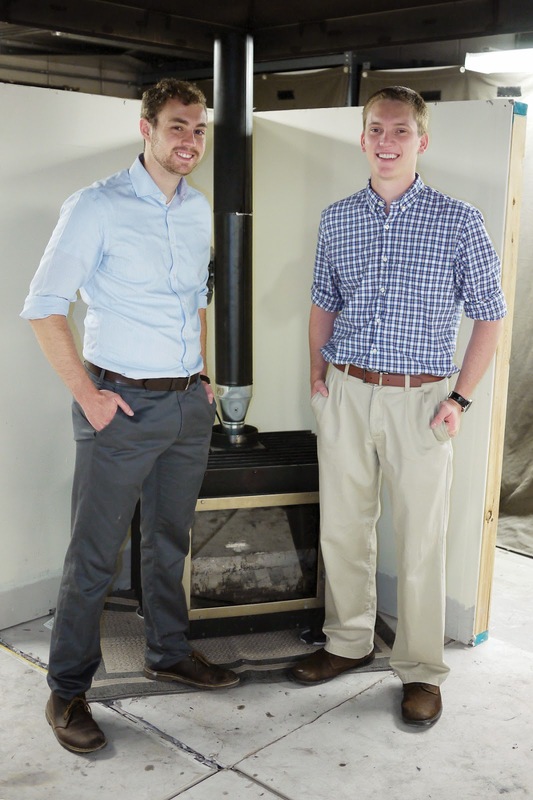 “These stoves have many of the solutions to excessive smoke from modern-day wood stoves and are challenging the EPA and the stove industry, to catch up with new technologies and new opportunities,” Ackerly said. The Wittus team with the Twinfire. While MF Fire stove, the Mulciber, had the highest combined score, several of the other stoves stood out in key areas. The German Twinfire, designed by the Wittus team, had the second highest overall efficiency, at 74%, and one of the lowest emission rates on a test run. Its automated air regulation enabled the stove to perform consistently well at different part of the burn cycle and it received the highest score for consumer appeal, for its downdraft flame into a lower chamber. The VcV, a New Zealand mechanical device that operates without any electricity, achieved the highest average efficiency, at 82% based in part on the lowest average stack temperature at 167 degrees (F), and the lowest emission rate on one of its tests. It also received the second highest marks for innovation. This was the only stove that did not require electricity and will be very affordable. Three out of four tests were very, very good, but on one the hot reloads, something happened and that reduced its overall numbers, and took it out of contention for first or second place. This device has undergone extensive R&D and is one of the entries that is closest to being ready for the market. highest for emissions. It was a highly innovative entry, employing dual cyclones, a pre-heated, continuously engaged catalyst and a fabric filter. Its sensors and controller kept the oxygen rates incredibly steady, within half a percentage point. The technology could be integrated into a new stove, or added on to an existing stove. The designers did not try to optimize efficiency, which impacted their overall score. The Kleiss, ready for testing. The Kleiss arrived at the competition with the hallmarks of an innovative, automated stove that could handle wet wood and nearly eliminate operator error. The stoves sensors and algorithms were designed to maintain very hot combustion temperatures and to allow the operator to call for more of less heat, while prioritizing cleanliness. However, the stove did not perform as expected, with secondary air contributing to primary burning with a large fuel load. Test results for all the stoves are available here. (References to grams per hour are not comparable to EPA gram per hour tests since the Workshop used tougher test protocols.) A series of presentations by the stove designers about their stoves and other stove and combustion experts are also available. 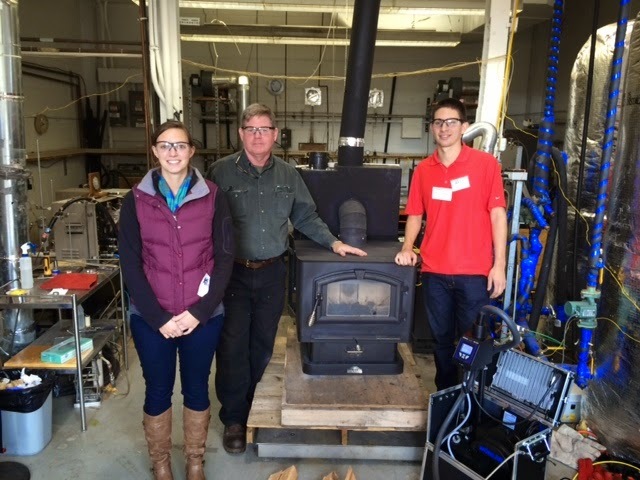 The Wood Stove Design Challenge is a technology competition that also strives to bring key stakeholders together to assess and learn about new stove technology. Primary funding came from the New York State Energy Research and Development Authority (NYSERDA), the Osprey Foundation and the US Forest Service. Testing support was provided by Myren Labs, Masonry Heaters Association and Testo and Wohler, two German companies who are pushing the envelope of accurate real time lab and field testing of particulate matter. The Chimney Safety Institute of America and Olympia Chimney donated the chimney installations, and Blaze King and Woodstock Soapstone also provided support. The 12 member Organizing Committee oversaw developing protocols, testing and scoring and included representatives from Alliance for Green Heat, Aprovecho Research Lab, Brookhaven National Lab, Clarkson University, Hearth.com, Masonry Heater Association, Massachusetts Department of Energy Resources, Myren Labs, NYSERDA, US Forest Service and Washington Department of Ecology. The Committee is now considering options for a 2015 Stove Design Challenge. Mcg/m3 pm2.5? Conc of toxic gases? Tox equivalent of all the pollution? Like tobacco smoke? Climate impact? Mercury deposition? 50% of the world heats with wood, so it is important to get this engineering as good as the engineering for oil and gas. Gasification, air/fuel ratio control, spark, and pollution control are all probably needed like with cars. For emergencies, kerosene heaters are cheaper and simpler. For everyday use, electric heat of some kind leveraged by heat pump technology with weatherization and insulation sounds best.